"Another overview of anhedral crystal mosaic" by M. Spilde, D. Northup et al. Cave: Quincy Mine, State: IL, Country: U.S.A. 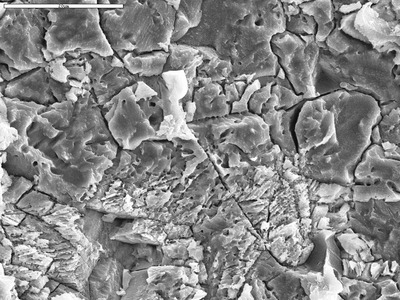 Image Type: SEM Image, Scale Bar: 20um, Magnification: 2000, Etch: No etching, Coating: Au/Pd, Instrument Location: UNM, kV: 15, Spot Sz: 6.